Nothing would have made President Rajapaksa's seventh budget speech more dramatic than the scuffle that broke out at the House on Monday. Reading of a budget, which ought to have exhibited the legislature's sense of pragmatism and the respect for democratic principles, instead, became a wrestling pit where the arm-power of some beat every other fundamental human quality, such as common decency and respect. 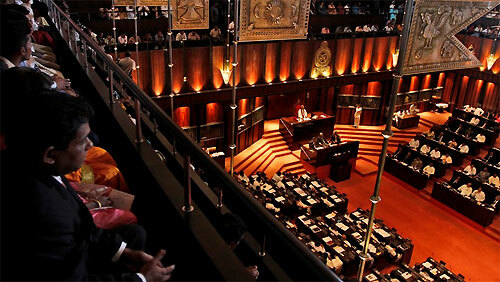 It is in this scenario that Speaker Chamal Rajapaksa pledged to conduct an inquiry into the incident that led to the departure of the Unpers from the House when the budget speech was in progress. In fact, this incident is not the first of its kind, nor will it be the last. The House has had its days when coffins and wreaths were brought in by the MPs as a mark of protest. Assaults had not been rare, for even the Buddhist monks who were elected to Parliament had not been spared despite their saffron robes. More often than not, the schoolchildren in the viewing gallery have been hurried out due to the abusive language used by the MPs during debates; the words that spill out from their mouths are too derogatory to be included in the Hansard. The picture they present in the House is far from what was printed in their election posters. The conduct of these MPs has been a cause of concern, yet nothing feasible has been done so far to curb the situation. It may be true that they are beyond the age of reform, and their behaviour at the House is nothing but the reflection of their real selves. None of these reasons belittle the fact that the two hundred and twenty five members elected by the people's vote are not there to epitomize political violence - their obligations to the public who voted them into power run much deeper than that. At a time when numerous allegations are levelled against Sri Lanka on human rights violations and suppression of the free media, the last thing the country needs is a set of parliamentarians showing their fistpower at each other, thus shredding the last remains of democracy into pieces. One cannot blame the international community for conjuring wrong pictures of Sri Lanka, when the very persons who brag about their patriotism, continue to tar its image with their unruly and undemocratic behaviour. After all, it would be too much to expect from the international observers, members of the diplomatic missions and foreign journalists who were at the viewing gallery, to leave their budget speech memories behind Parliament doors. Above all, their shocking conduct places the country's citizenry in a bad light. As the choice-makers who thought these individuals were fit enough to be people's representatives, the public have underrated the power of vote. Ignoring the growing trend of indecency both in and out of the House, the people had obliviously placed the cross before their names over and again. It is a shame on them alright, for behaving like a set of exotic tribesmen at the bottom of the civilization- ladder, who had no choice but to let their arms and legs talk when the language was not developed enough to express themselves. Shame on us too, for voting them into power and trying to envision statesmen who do not exist among modern-day politicians.